“Tell me more about the God talked about in this lesson and the Bible." India’s fast-growing membership has stretched the resources it has to train pastors, lay workers, and specialized ministries such as women’s and children’s ministries, stewardship training, lay evangelism, and many others. The new Pioneer Memorial Training Center will provide everything needed to house large and small training and conference services to the church in Southern Asia. It includes housing, cafeteria, and a 1,000-seat meeting hall year-round. When the training center is not in use, the nearby boarding academy hopes to use the conference center as a much-needed church and large-group meeting facility. To Sabbath School teachers: This story is for Sabbath, July 15. The wife of Chadamla (pronounced: chah-DAHM-lah) often visited spirit meetings and allowed herself to be possessed by the spirits. Chadamla hated it that his wife allowed spirits to possess her and demanded that she stop. But when he learned that she was going to spirit festivals he became angry and beat her for disregarding his demand that she not allow herself to fall under the spirits’ powers. He always felt sorry that he had hurt her, but he couldn’t seem to control his anger. Then one Sabbath he passed by a Seventh-day Adventist church near his home and heard someone inside speaking about a person named Jacob. He stopped and listened for several minutes. When the program was over, he entered the church and asked to speak to the man who had been talking about Jacob. When he met the man, he discovered he was the pastor of the little church. Chadamla told the pastor that he had listened from outside to the message and asked for more information. The pastor offered to give him a copy of the Sabbath School lesson study guide that the congregation was using, as well as a Bible. In just a few days Chadamla had read the entire lesson-study book. He looked up every Bible text mentioned. Then he returned to the church. “Tell me more about the God talked about in this lesson and the Bible,” he pleaded. The pastor said he would be happy to tell him about God, and the two men began to study the Bible together. During the studies, Chadamla discovered 1 Corinthians 3:16: “Do you not know that you are the temple of God and that the Spirit of God dwells in you?” (NKJV). He thought about this verse and reasoned to himself, Since the body is the temple of God, no one has the right to inflict harm on it. If I am beating my wife, it is the same as causing harm to the church, the temple of God. He realized that it was wrong to beat his wife. A few months after he entered the church for the first time, he was baptized. He changed his name to Samuel. Samuel told his wife what he was learning and invited her to join him in his Bible studies with the pastor. At first she refused, but as she saw the changes in her husband, her resistance softened. Her husband, who had yelled at her angrily when she went to the spirit rituals, became humble and kind to her. He stopped beating her. She saw how calm he was when he read the Bible and noticed that he prayed to this new God every day. Her own heart began to soften as well, and she began to attend Bible studies. Studying the Bible, his wife slowly became convinced that it really was wrong to be possessed by spirits. She came to know God and decided to stop going to people’s homes to participate in those rituals. But people kept calling her to participate in rituals. When she refused to participate anymore, they often cursed her. But she stood firm, faithful now to God rather than the spirits. Two years after Samuel’s baptism, his wife was baptized as well. She changed her name to Ruth. One day Samuel heard the pastor appeal for more Bible workers. 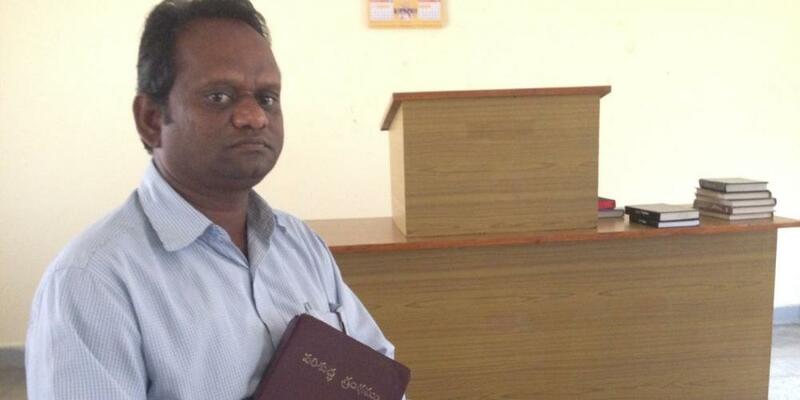 His heart was touched, and he decided to leave his job as a taxi driver to become a Bible worker. But Samuel felt he needed more Bible studies before he could be a Bible worker. The pastor enrolled him in a four-month program to prepare him for his new work. After that, Samuel joined the training program for Amazing Facts India. Then he took pastoral training. Today Samuel is 42 years old and the pastor of a village near his hometown. He and his wife, who lost two children to miscarriages while she served as a spirit medium, now have been blessed with two sons, 8 and 10 years old. Samuel regularly distributes copies of the Sabbath School lesson quarterlies in his town. He hopes that someone, like him, will accept Jesus. Part of this quarter’s Thirteenth Sabbath Offering will help complete construction on a training and conference center about 20 miles [30 kilometers] from Samuel and Ruth’s hometown in central India. This training and conference center will serve the entire Southern Asia Division. It be available for use by local church members like Samuel and Ruth, as well as by other people from around the division. Please remember this project and the Adventist work in central India in your prayers and with your Sabbath School mission offerings.